The last few days have been a bit suckass for me; and also for Levi. It’s like he knows Calvin isn’t coming back. 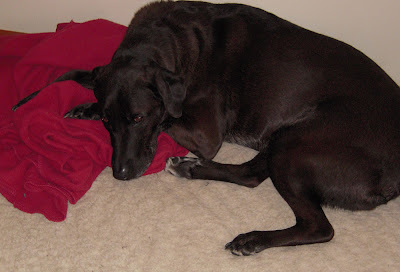 When I first got home from the animal hospital Levi greeted me at the door with his tail a waggin’, but once he realized Calvin wasn’t with me he went to lay down…in Calvin’s bed, not his….for hours. I try not to think about it but then I’ll get an email or a phone call from someone offering their condolences; which is kind of weird. Weird because they tell me they found out from reading my blog. The numbers on my Stat Counter have been on the rise (I don’t know why since my posts have been sparse), which makes me wonder who’s been reading. At least now I know who a few of them are. Anyhoo, instead of posting about my grief, I was planning on telling you about my time with Sheila and her kids on Sunday. The plan was for me to spoil her offspring and fill them up with sugary goodness for a few hours while she did whatever…whatever being Christmas shopping, laundry, napping or just playing with her toys (read Adam Robert…I’d link but she’s currently experiencing technical difficulties on her page). That didn’t happen. Sheila decided to spend the time with me, and truth be told it is what I needed. So we chatted as her son was glued to Wii and her daughter flitted back and forth between crayons, Play-Doh and baby dolls. Plans sometimes change, and on that day I’m glad they did. So nix what I originally planned on posting, because today after work as I sorted through the mail two of the what I assumed to be Christmas cards were not. One was from our regular vet and another from the emergency animal hospital I had brought Calvin to. They didn’t express the usual holiday greetings, but condolences. The one from our vet was signed by everyone in the office. The other one was signed by the doctor…and also Calvin. They put his footprint on it. With Paul being gone in India these last few weeks and Calvin…gone; the holidays just aren’t so jolly right now. Side note: Paul will be home shortly. I just hope he’s not disappointed that I’m not doing a tree this year. What a lovely gesture by the doc. Those little things can mean so much can't they? How are you doing otherwise? The card was nice. I know how you feel. Remember, I had my dog's t-shirt and collar hanging off the rear view of my van when we were at Avitaween. Hugs to you sweetie. I'm thinking of you. I'm sure Paul will understand. Still, so very sorry about Calvin. Oh,my god, that paw print made me cry, as did poor Levi. They really do feel the loss of their buddy. 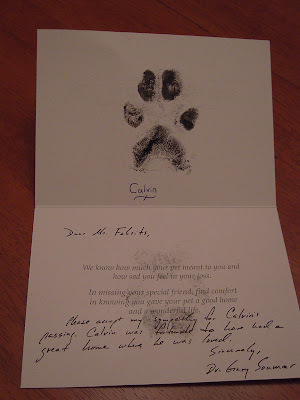 wow, that card is quite a meaningful and touching gesture from the vet. I am sure all Paul really cares about is seeing you and vice versa. Hugs, my friend! I'm sure a hug from Paul will help make everything seem just a little less sad. Such grief on that baby's face. I'm so sorry. It is so difficult to lose a pet. That card is precious. That is so touching. When our geriatric malamute died two years ago, everyone at his vet was sad because they loved him so. Much sympathy to you. It's very hard to lose them.